Hello Detroit! Thanks for visiting the Allen Park dental blog. Today we’re talking about eruption charts and what they are used for. 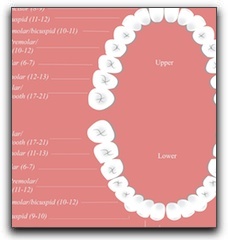 First, an eruption chart is simply a listing of the different types of teeth in the mouth and when, on average, they come out, or ‘erupt’, from the gums. A primary teeth eruption chart will also tell you when to expect the different teeth to be lost. Dentists in the Dearborn, Taylor, and Southgate area use these charts to compare the development of their patients’ teeth to the average times in the population. Hi. I’m Drs. Greg & Joanne Szalai, an experienced Allen Park family and cosmetic dentist. The friendly staff here at Szalai & Szalai DDS would love to schedule an appointment with you and answer any questions you have about eruption times, children’s braces, dental sealants, athletic mouthguards as well as questions about teeth whitening and Dearborn dental implants. Give us a call today at 313-928-2323 and we can discuss these services as well as smile makeovers.